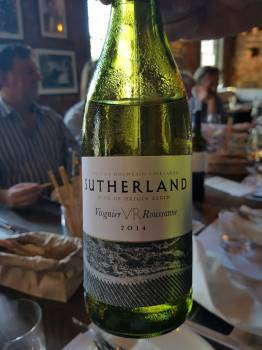 The white blend that is VR from Thelema’s Elgin property called Sutherland deserves to have a cult following. The newly released 2014 is once again super-tasty as well as coming in at a pocket-friendly R125 a bottle. A 50:50 blend of Viognier and Roussanne, the wine was fermented and matured for 10 months in second- and third-fill barrel. On the nose, some struck match character before citrus, peach and green apple plus an attractive herbal note. Pure fruit, fresh acidity and a pithy finish make this a particularly elegant and sophisticated offering.